Star Trek Reviewed: (216) Websites and Shorts Proposing Professional Series or Movies which have not been made or completed. (216) Websites and Shorts Proposing Professional Series or Movies which have not been made or completed. See the bottom of this list for articles which contain other lists of proposed professional series. Star Trek: Phoenix set itself out as a fan film, but after producing half a story, they are now trying to sell their series to CBS. On October 23, 2015, five years after completing Part 1, they declared they intended to create an audio drama to complete Part II. http://www.stphoenix.com/ . Star Trek: Phoenix Silver Age. (Late Silver Age, 2422). Because they are set 42 years after Nemesis, their uniforms are not those of any prior Trek. The Pilot episode, Cloak and Dagger, Part 1, 30 minutes long, is complete. It appeared online as streaming video or for download on Sunday, May 2, 2010 on their website, http://www.stphoenix.com/ . This group claims to include industry professionals. The home base is Seattle, Washington, USA. They offer downloads for both Ipods and Hi Def viewing. Months after release, this is being pitched as a pilot for network TV, although it was originally said to be a fan film. Cloak and Dagger Part 1 was released at Norwescon 33 on April 3 at 11:00 am Pacific. They showed this pilot at a number of public venues around Seattle, Washington in April, 2010. A press release on their website (I am not sure when it was placed there) on Sept. 11, 2010 stated that work was not being done to create Part 2, that no work would be done unless funding was found, and that the actors in Part 1 had not agreed to appear in Part II. A comment on their Facebook page on Oct 24, 2011 said no work was being done on any further episodes, although another person said they were working on a script. Much like Exeter could have been a show 40 years ago that would have been a great spin off from TOS. 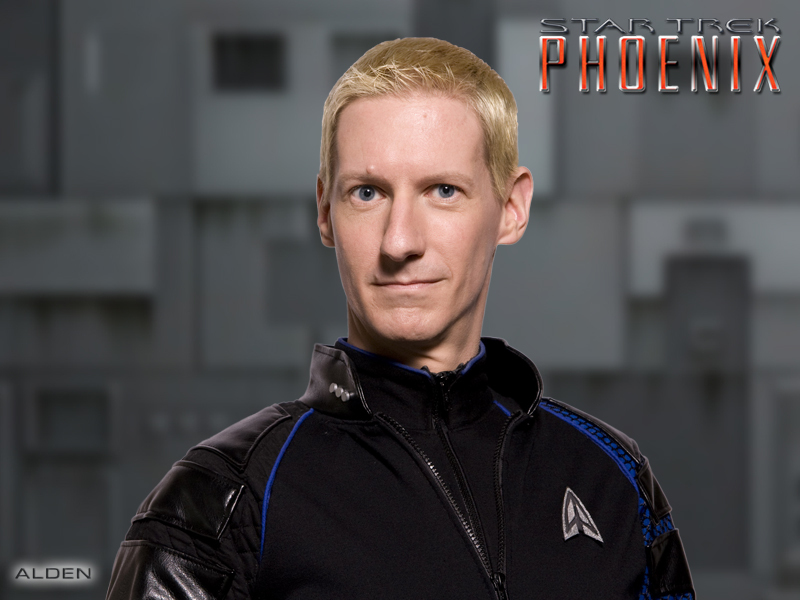 Star Trek Phoenix could have been a great spinoff for the next Star Trek. I know the Canon Trek has gone back in time for their Star Trek. And that didn't really work too well for Enterprise. It did work well for the movie but both are pretty flawed. Going to the future is what Star Trek was all about. Even though the writing quality in the TNG crews went down hill. That doesn't mean going back in time will change that. The thing I liked about this show is that it seems like a lot of the characters already have history. Some of it we don't know yet. Like the scene with the navigator and Capt. Avari. They seem to have a history on something it's just that we don't know what it's about yet. But there were other moments you can pick on right away. It seems like this show is trying to take the Kirk, Spock, McCoy type relationship with Avari, Alden, and T'von. They had Alden and T'Von making similar McCoy/Spock remarks against each other. Alden is really written a lot like McCoy in some ways even though they aren't the same. I love the new transporter effect. I love how it's quicker and more subtle. Sort of like the warp effect in the new Trek film that I am a fan of. I'm not as big a fan of the phasers, they seemed more like Star Wars type to me. I really liked the entrance of the villain in this episode. The one big complaint is that this was an episode mostly based on Avari and Alden. I'm not really sure I'm as interested in those 2 as I am some of the other characters. Which can actually be a good thing. I liked having different and new aliens we've never seen. and I hope they can go into those characters more. Solora being the best of those, but some of the other characters just aren't really developed or we don't really have any information on them yet. Overall I think this could grow to be one of the best Trek films. There's some things not quite right, but the production of this is really high quality. I could really see this being on TV today. I cannot wait to see more episodes. I've commented on this film on other sites so will be short & sweet here. Seen it more than once now & love it, on of the top fan films in Trek. If you haven't seen it than you need to. Would make a great TV of book series. However, as of July, 2011, this group seems to be planning another film, so perhaps it will turn back into a fan film. Several short from The Lions of the Night. Written and produced by Jimmy Diggs, who says he has written more Star Trek scripts for Paramount than any other writer. "Star Trek: The Lions of the Night" Animatic, also The Stalker but on (Apunkachoice)(3:01). Star Trek: Beyond the Stars. Glendale, California. Began in 2015, assorted postings on Facebook page. Various casting announcements in June, 2015. Left a message seeking updates on June 21, 2016. On June 23, 2016, they said that this is going to be a pitch, not a fan production. On 2/24/2017 they posted an announcement on their Facebook page that they had completed the script for their second episode. I left a message asking if they had released their first episode. They repeated that they were a pitch, and unless it was picked up as a pro series, it would never be made. In a back-and-forth in the comments under that post, Jimmy Diggs let it be known that the planned 2-hour pilot script would be entitled, "Star Trek: The Lions of the Night." Proposal for a new Star Trek Series set . This website proposes a new Star Trek series set between TOS and TNG featuring Captain Sulu and his starship Excelsior. The website offers a guide to materials about Captain Sulu and his Starship, including graphic novels, references to it in existing Professional films and TV show episodes, and seven novels, and three audio novels. The website is a product of Curt Danhauser, and he will undoubtably add materials when they are produced. He has not, however, included Phase II/New Voyages World Enough and Time, which also centers on Captain Sulu. Warner Communications owns (and sells) two proposed pilots for Gene Roddenbury TV shows that didn't sell. One called, "Planet Earth", the other "Genesis II"
The Rikers of Space, a proposal (only half kidding) by Marina Sirtis and Jonathan Frakes for a half hour Star Trek family sitcom. Fox produced a pilot, but did not pick up the Trek Parody, Boldly Going Nowhere. This proposal was put together by serious Hollywood pros, but never pitched because JJA Trek was started. Set in the year 3000, it would have been far beyond the scope of other Trek in terms of projections. Star Trek: New Destinies http://www.youtube.com/watch?v=Cy6ANdkkuEo&feature=related appears to be opening credits for a series based on the JJA Trek movie. No TV series could afford this set of movie actors, though.